The BEST book clubs discussion usually have people who passionately (but respectfully) disagree with one another. This was one of those books that people either seemed to LOVE or HATE. Just like that. Strongly. Capital letters LOVE or HATE. So our entire discussion felt like a game of two halves. Someone would say that it was well written; while another would note that it read like poorly written fan fiction. A few book clubbers thought that the relationship between the two main characters was unhealthy and one-sided; others found it to be romantic and balanced. It was unnecessarily smutty versus a sensitive love story. And so on. Which makes for a excellent conversation but a rather tricky write up! The writing was the first issue we couldn’t agree on. On the one hand, the book was seen as poorly written fan fiction. Indeed, it was compared unfavorably to Twi…light. And this was only the first comparison with that *shudder* epic series. On the other it was seen as beautifully written – in particular one or two of us were struck by the opening page – the contrasting descriptions of Patroclus’ father and mother absolutely sucked us in! The book was described as a trashy romance with the backdrop of Trojan war, while others noted that anything written about Greek myths is a re-run; that it’s particularly difficult to say anything new about stories that have so permeated our collective consciousness but that everything old is made new again in literature. One of our book clubbers had read the book previously and found that it stood up to a repeat reading. Structurally, the time jumps didn’t always work. The first section of the book seemed to flow very well, but later on the jumps seemed to be abrupt. There’s a war going for a decade – with a grotesque amount of bloodshed and death – but it didn’t always seem like much was happening at the time. In a similar way, we weren’t also able to gain a proper sense of geography or location. The castles are opulent, Chiron’s garden is eden like and the battlefields are violent and bloody. There wasn’t really anything groundbreaking in the presentation. Which tied into a disappointing sense of inevitability for some of the readers. As we were so familiar with the endings of the major characters that there was less a sense of anticipation than waiting for the next step. None of the main character had any agency and every few pages we were reminded that there were prophecies that set everything in stone. This was contrasted with Shakespeare where, regardless of whether we know the plot or outcome characters are written so well that a person could hope for a different outcome. Then again, there is only the one Shakespeare for that very reason! While some amongst us enjoyed the perspective offered by Patroclus; others felt that the author’s voice was too/the only one present throughout. That rather than being an immersive experience, it was merely the Homer story retold from Madeline Miller’s perspective. For the most part, we did enjoy that this was very respectful to the source material – for example the presence of gods and centaur’s are not explained away but play the role (or a version of it) as originally envisioned. Similarly, there is not mention of the infamous ‘heel’ as it wasn’t part of the original tale…though this was disappointing to at least one book clubber who found Achilles to be a numpty and would have liked to have him picked up by his ankle and spun around till he had some sense! That might look odd written down but it absolutely captured the mood and the majority’s perspective! (Though we did also note that the heel could be seen as a metaphor for his great flaws – his unyielding pride and the ego that forced him to go to war in the first place – see, we’re intellectual giants as well as hilarious). We wandered off for a little while on the topic of Troy, where Petroclus is written as Achilles cousin and the differing way of interpreting Homer’s epic. It *was* shocking that Achilles fell apart when Patroclus died; that he became so brutal and violated Hector’s body and that they had a shared tomb. Frankly, this perspective – to me if no one else – felt more reasonable and reasoned an explanation. One of the more agreed upon points related to the absence of strong characterisation. Very few of those present are given much depth (though it depended on whether you enjoyed the book or not if that applied to the two primary protagonists) and those that are developed are pretty unpleasant. Odyssey for example comes off well at his initial appearance – he loves his wife for example – but that starts to falter the longer you peer at him – sure he loves his wife…from a great distance! Ultimately, as entertaining as he may be, he is also a bit of a manipulative bell end. One of the better developed secondary characters was Thetis – awful but also what choice did she have? She has a fantastically horrible origin tale. I for one felt that context definitely made her what she is. We agreed that it was essential to have included her myth as otherwise she was purely monstrous. With it’s inclusion, her story as one marked by a familial betrayal (by the Gods). Her son was destined to be greater than his father so the Gods let her be abused, captured and – not to put to fine a point on it – raped by a mortal. From that point onwards, she is mighty in Patroclus eyes, but diminished in every other scene by men. As a lowly water nymph, her situation results in her being so much less and yet more that she would have been before. Still, due to the war situation; we found it fun that so many of the ‘notables’ of Greek mythology were able to bob in without it feeling forced or crowded. It was frankly a ‘really rubbish time to be a woman’. Now is…better, we agreed after some consideration – at least for us in the UK but back then it was a truly SHOCKING time to be alive and female. I mean Thetis was a cold, hard mummy-flipper, arguably driven to it by her treatment by both the Gods and King Peleus (though we agreed that her raising Pyrrhus to be an unapologetic sociopath was a bit of a mark against her) but every woman in this is subjugated to some extent. Perhaps none more than the daughter of King Agamemnon – Iphigenia. She is dragged into our tale ostensibly to be married off to Achilles. Less than a page later, she is instead killed by her father to appease the goddess Artemis AND MAKE THE WINDS BLOW. Seriously, that’s her sole purpose in life. And, perhaps, obliquely to demonstrate to Achilles that he cannot change destined events; that he is powerless to act in certain situations. It’s pretty grim really. Perhaps the most conversation revolved around the love story between Achilles and Patroclus. For some their youth spoke against them and there was no depth or sensitivity. It was an unhealthy relationship with a power imbalance. And that the relationship was similar to that of Bella and Edward in Twi…light. Bella/Patroclus feel small and undeserving; demonstrating an element of hero worship in their affection for Edward/Achilles. While I spluttered incoherently, a more articulate book clubber noted that this was a false comparison. Patroclus was a character who was deeply damaged by his father and abandoned by the age of 12. Bella was 17, raised in a normal environment with a family who supported and loved her. Sure, there is a one sidedness to the depiction but even in Patroclus humble assessment; Achilles frequently demonstrates that he sees more in Patroclus than the protagonist does in himself. For some of us, there was an element of Plato in their relationship. When they were with Chiron; they proved that they complemented one another, that each provided what the other lacked. Oh great, I’m all sobby again! 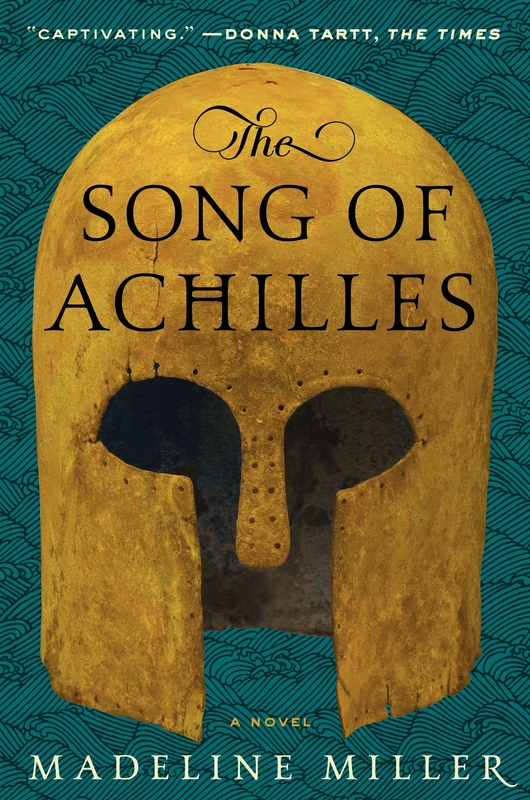 We also chatted a little about Achilles’ sojourn in Scyros. We found it very strange that Achilles would have agreed to go to King Lycomedes; that he would have accepted dressing up as a woman – the ‘humiliation’ of discovery of this which led to his decision to fight …let alone his curiously unemotional seduction by the Princess Deidameia – who had some serious self esteem issues and a woefully unsuccessful taste in men. Though of course it *had* to be included in order to ensure that Pyrrhus was born. For many of us, one of the most jarring scenes was when Patroclus slept with Achilles wife Deidameia – it felt as though he was motivated by pity and some sense of having something that he could keep from Achilles. While it did introduce a different dynamic – after all Achilles had revealed all about what he clearly saw as his betrayal of Patroclus – the man he treated and declared as his husband; it never went anywhere. Patroclus kept his secret. He never used it or seemed to reflect on it again. Perhaps it was there to contrast with his proposition by Briseis – due to his genuine affection for her, he couldn’t consummate? Strange and odd. The ending was – as you have probably gathered – equally polarizing. For those who knew their history; it was inevitable. Personally, I found it to be a victory. That it was Thetis – who had finally had her way; who had taken a child and raised him to be a monster hero – that she had allowed Patroclus to tell his memories and therefore justify his place in history alongside the man he had so utterly loved for so long. Perhaps that is also fulfilled in some way the maternal instincts that were either not natural to the gods or suppressed in her for so long. That she finally conceded his value by adding his name to Achilles’ tomb. One of the clubbers spoke of how Alexander and many others had visited the tomb as a place for lovers for a long time after their deaths and I all but cried in front of everyone again! Honestly, something about this book brings out the inner sap in me and no mistake! ‹ PreviousEVENT – Bristol Literature Festival! Fantastic write-up by our book club leader.